Creating social welfare systems that care for those who are struggling is a relatively recent phenomenon. Over the past 130 years, we have tried many different approaches to helping people improve their chances to live healthy and productive lives. The following essay sketches out how some of those programs have evolved over the years and lands us at today’s debate over how we should organize our social services sector and pay for it in the most effective way possible. We are hungry for innovation and a breakthrough. Too many individuals and families are suffering and not living up to their potential. It is both a moral issue and an economic one. The status quo is expensive in terms of paying for the negative effects of failure in the social sector (e.g., incarceration, chronic disease, underemployment, and remedial education). In this book, we ask a number of questions about the status quo: Could social service resources be spent more effectively? Might one important strategy be paying specifically for the outcomes we want? Is that even possible? This essay, and the essays in this book, are an effort to explore how we might pay directly for the outcomes we want as a strategy to achieve the breakthrough that is overdue. Competition for industrial jobs drove down wages in many industries. Competition for places to live near those jobs drove up rents. Leaving home for the city cut social ties that were traditionally provided by families and small, tight-knit communities. A significant result of these three trends was the creation of slums or ghettos, where struggling low-income Americans concentrated. For some, the distance traveled from farms to ghettos was short, and others crossed oceans and continents. Many of the new arrivals thrived, but for those who didn’t there was not much of a social safety net. Churches and charities provided some relief, as did local governments, but these efforts were small in comparison with the growing problem. There were early coordinated efforts to help stabilize new arrivals to the cities. Pioneers, such as Jane Addams in the late 1800s, addressed these issues through the Settlement House movement, which might be considered the first place-based/cross-sector intervention for low-income communities. And tight-knit immigrant communities were able to provide for many of the needs of new arrivals. These efforts, however, were small and local. 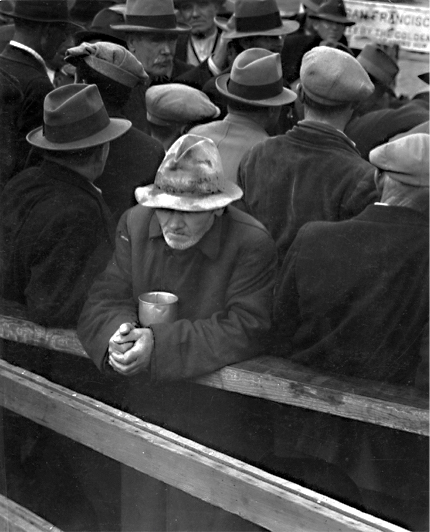 Source: "The White Angel Bread Line" by Dorothea Lange, San Francisco, CA, 1933; Records of the Social Security Administration; Record Group 47; National Archives. Note: The data for 2013 and beyond reflect the implementation of the redesigned income questions. Source: U.S. Census Bureau, Current Population Survey, 1960 to 2016 Annual Social and Economic Supplements. The economic development and jobs programs of the New Deal — and later, the massive spending to mobilize for the Second World War — got the country working again. After the war, a combination of successful public policies and economic growth drastically reduced the percentage of Americans living in poverty. 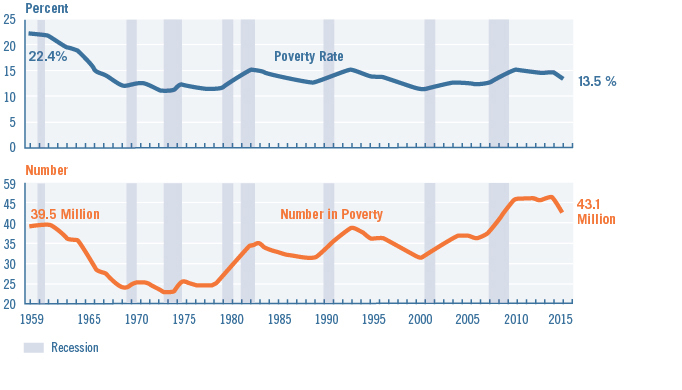 Between the 1940s and the early 1970s, the U.S. poverty rate was estimated to drop from 33 percent to a low of 11 percent in 1973.7 In real terms, family income grew almost 75 percent from the end of the Second World War to the mid-1960s.8 In the 50 years since then, however, the poverty rate has been stubbornly persistent between 12 and 15 percent (see Figure 1 above). Meanwhile, the absolute number of Americans living in poverty has risen with the nation’s population growth. CDCs and social service providers were often constrained by lack of capital, and their projects and initiatives often required extra help to underwrite financially. Loans, initially from the pension dollars of nuns and churches, were the first into this financial breach. Those loans spawned a new type of institution to meet the credit needs of low-income neighborhoods, the community loan fund. The loan funds were the precursors to community development financial institutions (CDFIs) that got federal funding in the early 1990s. The government funding programs that grew this small network of CDCs and CDFIs came from federal block grants (Community Development Block Grants and HOME Investment Partnership for affordable housing) and tax incentives in the form of investment tax credits (Low Income Housing Tax Credit and New Markets Tax Credit). There were private-sector sources of funding as well. Many banks were motivated to engage CDCs and CDFIs as a way to meet their requirements under the Community Reinvestment Act (CRA) of 1977. The CRA was an explicit policy to end “redlining,” a practice where banks would take deposits from a community but not lend back to it because it was low-income and considered too risky. This practice stripped wealth out of communities and was particularly devastating to African American neighborhoods. Philanthropy also played an important part in building this new system. In addition to the work of the Ford Foundation mentioned earlier, many leading philanthropies invested in the creation and growth of the community development network. This extended beyond grantmaking as well; many foundations experimented with new ways to finance community development work through program-related investments (PRIs), which provided a below-market rate of return for their investment in exchange for funding activities that promoted the foundations’ missions. And another development were mission-related investments (MRIs), which were similar in promoting a social outcome but with a market-rate return. The glue keeping these different groups working together was the funding from the many sources of community development finance. This funding provided the effective “demand” that created a market for community revitalization. CDCs and CDFIs were the first into this marketplace, but other for-profit real estate developers and banks followed. In the end, this system was successful in creating tens of billions of dollars of investments into low-income neighborhoods. Overwhelmingly, these investments were in real estate. In the early years, most of the investing was in affordable housing (often with social services embedded in them). Later, however, there was more investment in clinics, charter schools, homeless shelters, and grocery stores in food deserts. There were practical reasons for this; lending against property is easier for banks since there is collateral against the loan. But the theory behind the community development strategy was that if you could improve the physical place — the disinvested neighborhood — then you would create new opportunities for the people who lived there. As Nancy Andrews, chief executive of the Low Income Investment Fund, once said, “We thought if we got the buildings right, everything else would take care of itself.” The challenge of creating opportunity in low-income communities proved to be harder than that theory of change anticipated. Community development finance is not to blame for the lack of success in the fight against poverty over the past 50 years. There were many headwinds in this fight; chief among them was a dramatically changing economy — thanks to globalization and technology — that reduced the need for low-skilled workers. As a strategy to overcome poverty, improved real estate may be a necessary condition. However, it is insufficient to dramatically improve the lives of people who live in those neighborhoods. All communities need both place- and people-oriented strategies to improve health, increase incomes, and reduce the incidence of poverty. Poverty overwhelms narrow interventions because it results from a culmination of causes. Put another way, social exclusion is the product of many overlapping and reinforcing social exclusions. These overlapping obstacles include disinvestment in neighborhoods, deteriorating buildings and substandard housing, and lack of transportation and other amenities — parks, good schools, access to affordable fresh food. But there are human-capital contributions to poverty as well — poor physical and mental health, lack of competitive job skills, and insufficient support from one’s family and community. Terri Ludwig’s chapter in this book tackles this question squarely: Can a system that has been built to invest many billions of dollars annually in places also be configured to invest in people? Our current policy era is one that prizes the need to be “comprehensive” and to coordinate services among multiple service providers. The drive to coordination has flown many banners — Comprehensive Community Initiative, Comprehensive Community Development, Neighborhood Improvement Initiative, Comprehensive Community Revitalization Program, Neighborhood and Family Initiative, Rebuilding Communities Initiative, New Futures, and Sustainable Communities (and the many other Obama-era federal initiatives). These many efforts have had mixed results, but it is safe to say they are all in the rearview mirror; today the focus for coordinated social interventions is on the concept that FSG Consulting calls Collective Impact. 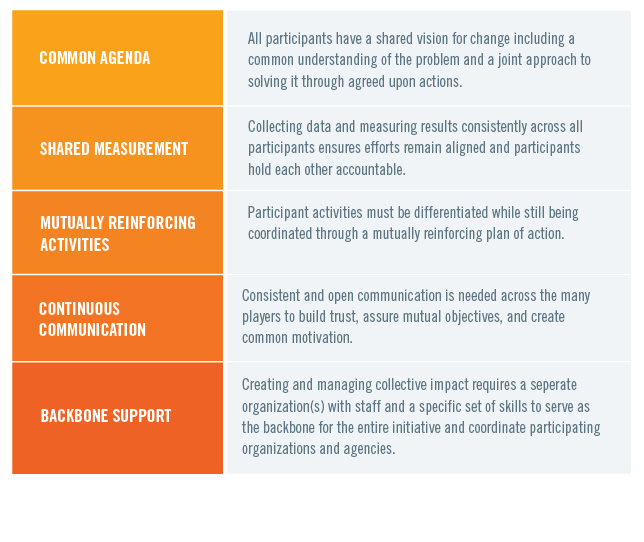 In the Collective Impact model, there are five fundamental aspects to achieving better outcomes: 1) a common agenda, 2) shared measurement, 3) mutually reinforcing activities, 4) continuous communication, and 4) leadership and coordination from a backbone organization (see Figure 2). Source: Fay Hanleybrown, John Kania, and Mark Kramer, "Channeling Change: Making Collective Impact Work," Stanford Social Innovation Review (January 26, 2012). That is not scalable or replicable. The lesson, it seems to me, is to find a way to reverse-engineer the genius (or “influential champion” in the FSG framework) and the billionaire (or “adequate financial resources,” according to FSG). The premise of this book is that the billionaire is replaced by the wiser use of public and private dollars to create a quasi-market for social outcomes that employs both people- and place-based strategies. Put differently, this transition to the market does not require new public dollars. Rather, it requires a rearranging of the many tens of billions of public dollars that are already being spent on expensive but not value-producing activities or things, such as treatment of chronic disease, incarceration, enhanced policing of poor neighborhoods, special education resources spent on children who are not ready to learn when they arrive at kindergarten. This new market is likely to behave similarly to the quasi-market that was created by community development finance for community-enhancing real estate development in the 1980s and 1990s. There will be new institutions, like CDCs and CDFIs — or new activities within existing institutions — to develop projects and finance them. There may be some private-sector players entering this market as well. But the essential element of this new marketplace will be a cadre of community entrepreneurs who will combine their deep knowledge of their particular neighborhood’s and population’s needs with their problem-solving and bridge-building skills. Community entrepreneurs are the CDCs of the twenty-first century, and they will be the ones to play the role of the super-geniuses in community change. Similar to entrepreneurs in the general economy, community entrepreneurs can come in many stripes. Perhaps the ur-example, however, is Geoffrey Canada, who started the Harlem Children’s Zone. I have been struck by how many people I have met over the years who could play the role Canada invented. It helps that Canada had the support of high-net-worth people in New York City. But I know someone like Chris Krehmeyer, chief executive of Beyond Housing in St. Louis, is able to orchestrate new affordable housing construction, maintain a health-oriented grocery store in a food desert, and connect his residents to high-quality services they need — from child care to job training to substance abuse treatment.25 Krehmeyer, a cross between a community organizer and a riverboat gambler, could be just as effective as Canada with the right financial backing. If we organized a market that valued better health, for example, and there was a cash flow for achieving that goal, there is no doubt that community entrepreneurs would rise to the challenge. And, once this role is more established, I suspect elite MBA programs would start training the next generation of community entrepreneurs. What we are trying to capture in this book is not just that we think that programs should have a deeper evidence base to know whether they work. They should. But what we are proposing here is more than that. It is an effort to create a new way of doing business that allows us to create clusters of programs that work in concert to achieve better outcomes than any one program could achieve alone. We hope for an ecosystem — or market — that creates the right incentives to collect, analyze, and be guided by data. This market also incentivizes better cooperation among multiple players from multiple sectors. To that end, this book proposes that paying for outcomes — the actual desired outcomes, not simply the programs or infrastructure we “think” will get us there — will generate new business models to achieve better social outcomes. In some ways, it is a follow-on book to two books in the What Works series: Investing in What Works for America’s Communities, which focused on new place-based/cross-sector interventions to improve low-income communities that incorporated both people- and place-based investing strategies, and What Counts: Harnessing Data to Improve America’s Communities, which focused on how the appropriate use of data could better align multiple sectors to achieve better outcomes. This book, What Matters, is an effort to find new ways to finance these new business models by focusing on outcomes. All three books tell parts of the story of the march toward outcomes-based funding, and the ultimate creation of a market that values social outcomes. Poverty, as stated previously, is a product of overlapping and reinforcing phenomena. Another way to describe that reality is to say that poverty is a complex adaptive system. Each issue — housing, jobs, structural racism, transportation, education — has ways in which it can make the problem worse or better. Guiding a response that provides the right intervention, with the right partners, at the right time, and at the right scale, is very hard. The relevance here is that we could build a complex adaptive system by inventing an end goal — a child ready to learn at kindergarten, a student graduating from high school, a formerly homeless person who is stably housed, a retrained worker who holds a steady job, etc. — that has the potential to help align the many organizations to work together more effectively across sectors and silos to achieve these outcomes without a central planner. At times, we think of this as an ecosystem that allows for multiple players to use their strengths (operational abilities, knowledge of local conditions and the population they are working with, trust from years of providing good service to the community, etc.) to act on newly emerging information (new data analyses, changing characteristics of a population, new partners, new business models, etc.) to find ways to improve their results. But another way to think of this is as a market for social outcomes. When we use outcomes-based financing to create a quasi-market for improved social outcomes, we create incentives for comprehensive and coordinated social service interventions. These incentives create a market dynamic where independent actors are responding to market mechanisms (i.e., simple decision rules) to achieve a desired outcome. In this marketplace, there will be community entrepreneurs who will lead us through potential breakthroughs or innovations. Those community entrepreneurs will need funding (and the existence of funding creates more community entrepreneurs). They will need data and analysis. They will need partners who can deliver on certain aspects of an outcomes-oriented business plan. Consider the analogy of a general contractor building a house. A general contractor has to coordinate subcontractors, such as the carpenter, plumber, electrician, and painter. Similarly, the community entrepreneur will have to assemble a team of “social subcontractors” — teachers, affordable-housing builders, household financial stability coaches, nurses — to meet the needs of his or her community. In many ways, the community entrepreneurs resemble the community quarterbacks from the What Works book, but it is intended to be a larger concept that allows for coordination of more than a cross-sector intervention; it would be the entity that owns the outcomes risk and might be the one to employ several community quarterbacks to achieve the desired result. This combination of general contractors and subcontractors will be different in every place; no one size fits all. This is why so often policies and programs emanating from Washington, DC, or state capitals, don’t work. In some places, issues around racial justice and healing might be the first priority. In other places, the highest-order concerns may have more to do with a deadly scourge of opioid addiction, requiring a public health intervention to stabilize the community. A third community might be struggling with the loss of low-skill/middle-wage jobs at a factory, mill, or rural regional hospital. In this third case, the first intervention might be to focus on the stability of families in economic transition (especially their children), with a tighter focus on job retraining and optional relocation to higher-opportunity communities. Still other interventions might first focus on the celebration of local culture — of Native Hawaiians or Mexican Americans in the colonias along the Texas border, for instance — as a first building block toward building stronger community cohesion and a foundation on which to brainstorm plans to lift the community. In all cases, the community entrepreneurs will have to use their knowledge of the community to guide their strategies. Of course, that strategy will constantly be challenged or reinforced by using real-time data to measure progress. Hitting the appropriate milestones along the path to the ultimate outcome will be critical. And the strategy will have to evolve constantly. What worked in the first time period will not work in subsequent time periods. Solving one problem (e.g., crime) often triggers another problem that will require new types of interventions (e.g., gentrification and displacement). Not only does a market that values health help focus our concept of an improved multisector and place-based intervention, but it also connects to the largest potential funding source for this new market. The scale of spending on medical care is mindboggling. And much of it would be unnecessary if we made appropriate investments upstream in people’s lives to head off the development of avoidable chronic disease. And the numbers are getting worse: By 2024, the United States is projected to spend $5.5 trillion on medical care.35 There are no medical breakthroughs that will bend this cost curve. But there may be a great opportunity in avoiding illnesses before they start by creating opportunities for low-income families and in low-income neighborhoods. Improving wellbeing is the fair thing to do, but it also could be an enormous cost-saving strategy. For two very compelling discussions on this theme, see essays by Peter Long, and Tyler Norris and Jme McLean, in this book. So if medical care is not a sufficient strategy, what other levers are there? One is education. A college graduate will live, on average, nearly a decade longer than a high school dropout when their life expectancies are measured at age 25.36Income is another lever. For adults reporting poor health, 31 percent live below the federal poverty line, and only seven percent earn four times the poverty rate income.37Health issues like chronic disease, obesity, violence, and other ailments melt away as people overcome the layered causes of poverty. Although we do not call out health specifically in the title of this book, many of its essays focus on improving health. And the book itself is dedicated to S. Leonard Syme, a UC Berkeley social epidemiologist who helped us down the path toward outcomes-based funding by pushing us to think of the needs of the whole person rather than siloed focuses on medical care, or housing, or jobs, or education. There are a number of entities that are interested in paying for better health outcomes, and for the purposes of this essay, I will call them buyers. Some of them are obvious: The federal government, through its Medicare, Medicaid, and Veterans Administration health programs, is the 800-pound gorilla in that category. But there are others, too: health insurance companies, employers who self-insure their employees, hospital systems who are concerned about the costs associated with readmitting patients without the ability to bill for additional procedures, foundations that care about health (e.g., Robert Wood Johnson, Kresge, and health conversion foundations like the Colorado Health Foundation or the California Endowment). And of course, as we get more comfortable with the expanded concept of health as wellbeing, there are many other funders who pay for the building blocks for good health: affordable housing (HUD and the Low Income Housing Tax Credit), jobs (Small Business Administration and the New Markets Tax Credit), transportation (infrastructure spending), and schools (Department of Education and state governments). In this system, there are also connectors who play an important role in making this market work, and several of the pioneers are authors in this book. These connectors are often Pay for Success strategies and vehicles, like the Strong Families Fund described by Kimberlee Cornett. Or the Equity-with-a-Twist tool developed by the Low Income Investment Fund and described here by Nancy Andrews. The tool that Maggie Super Church’s essay discusses, the Healthy Neighborhood Equity Fund, is a connector. She was motivated by a simple question: Why can we invest in a pill that lowers blood pressure but we can’t invest in a neighborhood that does the same thing? Her fund has an interesting mix of “buyers of health” that are investing in neighborhoods to make them more salutogenic: banks, hospitals, and insurance companies (in addition to many government and philanthropic sources). We are at the very beginning of developing the connector tools and vehicles to marry buyers to sellers, but once we have more than a few pilots, the potential here to create a large and vibrant market is enormous. Of course, the best possible connector is a health entity that is either an organization that is both an insurance company and a medical care provider (e.g., Kaiser Permanente; see Tyler Norris and Jme McLean’s essay) or an insurer that owns the majority or all of the downstream medical-care cost risk for a population that is relatively contained (e.g., a large, self-insured corporation or a rural county with one health insurer). These entities would be on the vanguard of the “population health” business model, where they are paid per person/per year to keep someone healthy. Unlike the largely fee-for-service medical system as a whole, their business incentives are aligned with health rather than illness. The healthier their members, policyholders, employees, or residents, the better off they are. That arrangement is the ultimate connector, since it has a significant motivation to work upstream to improve the social determinants of health to save on downstream medical-care cost risk. That insurer, leading a coalition of other buyers of health, would create pockets where a market that valued health could take root. The market helps facilitate many players who are working on a particular neighborhood through better coordination, but an even more interesting aspect of this mechanism is the capability of expanding beyond traditional areas of doing business. In the past, we have concentrated our efforts on low-income people in low-income neighborhoods. There were good reasons to do this because these were the areas of highest need. It allowed for better coordination of services. But a new mechanism could cast a wider net to identify those in need who are living in middle-income or affluent geographies. The concentrations would be less (ten to 20 percent of the residents perhaps), but the total opportunity may be greater because there are more of those communities. This wider net could apply the same market for better social outcomes as will exist in low-income areas. Expanding this market to cover wider geographies solves a problem identified by Elizabeth Kneebone and Emily Garr at the Brookings Institution, where they found that “by 2008, suburbs were home to the largest and fastest-growing poor population in the country.”43 It would be a new tool to reach into those areas with less of a history of poverty, and thus fewer institutions to address it. The market would help organize social service networks that don’t have the benefit of longstanding relationships and geographic density, as exists in older urban centers. And, of course, having a more universal system in place to catch all those in need would encourage a more stable political base of support. The market that values health will build a demand for community entrepreneurs, and the selection process for those leaders has equity baked in. The people most likely to be successful in this job must have both problem-solving skills and a deep understanding of the community in need. This combination almost guarantees that the teams that the community entrepreneur builds will also reflect the racial, ethnic, language, cultural, gender, sexual identity, and other characteristics of the community they serve. In addition, this new market will create new job ladders for community entrepreneurs and their social subcontractors in their communities. We saw something like this happen in community development finance, where local residents got their first jobs at the neighborhood CDC. Over time, they developed skills that were valuable to other employers, and many went into government or the private sector. This created a new job ladder in communities that lacked the connections to gain experience and advance professionally. As this market develops, it will create a need for new technology to serve the needs of the new business models. Caroline Whistler and Matt Gee, along with Emily Gustafsson-Wright discuss the need to develop new information technology tools to make cross-sector and place-based interventions work more effectively. It will require ways of tracking financing to help community entrepreneurs decide where to best spend limited resources on the margin for better outcomes. An abundance of data will create an explosion of academic and policy research, which could bring about an atmosphere of innovation and sharing of knowledge. All the transactions in the market that values health will leave a trace of data on what was tried and what worked. In the way that financial markets rely on millions and billions of transactions to build financial models and measure risk, we will finally have that number of data points to develop much more sophisticated interventions in the social sector. This could trigger nothing short of a paradigm shift in how we think about poverty, as Jacob Harold describes in his essay. Of course, data do more than simply guide more effective interventions. They are a language, as Cassidy explains in his essay: “An important step to leveraging this growing body of evidence will be to develop a common language in describing outcomes and measuring performance.” And when we all speak the same language (interoperable data systems) and all focus on the same target (outcomes), then we have the ability to coordinate across institutions. This was the never-realized dream of the many comprehensive community development initiatives mentioned eariler. There is a structural inertia that makes a culture of innovation both elusive and incredibly scalable if we are able to drive that inertia toward outcomes for the largest organization in service of humanity…. We have the opportunity to ignite a public-sector innovation revolution in our lifetime. We recognize that this approach to financing social change has risks. It will be disruptive and create winners and losers. Many organizations that have long track records of helping communities might not be able to participate in this new outcomes marketplace. We need to build in the ability for legacy organizations to transition to new funding realities or find compassionate ways to wind them down. At the end of the day, we want to see a shift where governments and others pay for what outcomes they want rather than paying someone to follow a recipe that often does not work. Paying for outcomes creates a demand that begins to reshape institutions, behaviors, relationships, and culture. An open structure, like a market, will permit problem-solving ideas to come from every direction. It is inherently anti-monopoly, pro-local, and community-empowering. It may create the breakthrough we so desperately need. In the 1890s, most of America’s large cities were building power generation and distribution systems. Some argued that this new technology should be owned by the community at the neighborhood level and held as a local asset. The production costs might be higher than at a larger, regional power plant, but the distribution costs were less. In contrast, the cost-per-kilowatt advantage of the regional plant was offset by higher distribution costs. It was a wash. But the regional system won out. Why? According to Stanford professor Mark Granovetter, the reason was that elites preferred to have the option of investing in the new utility.47 The final outcome was not determined by the technology; it was a process determined by power. Elites wanted to invest in this new value stream. Soon communities will be creating value by improving wellbeing using the incentives and tools of outcomes-based funding. The evolution of the market that values health could follow a similar path to electrical generation. As we transition to this revolutionary approach to creating and paying for better social outcomes — complete physical, mental, and social wellbeing for all Americans — let’s be mindful that it is the communities themselves who are creating increased value and should share in its rewards. Thanks to my Federal Reserve colleague Ian Galloway for his assistance with this chapter. The views expressed are my own and may not reflect those of the Federal Reserve Bank of San Francisco or the Federal Reserve System. 1Library of Congress, Civil War Desk Reference (New York: Simon & Schuster, 2002), p. 74. 2U.S. Census, “The Urban Population as a Percentage of the Total Population by U.S. Region and State (1790–1990),” available at https://www.census.gov/population/censusdata/table-4.pdf. 4United Nations Population Fund, State of World Population 2007: Unleashing the Potential of Urban Growth (New York: United Nations Population Fund, 2007), p. 1. 5David M. Kennedy, The American People in the Great Depression: Freedom from Fear, Part One (New York: Oxford University Press, 1999), p. 163. 7Robert D. Plotnick et al., “The Twentieth-Century Record of Inequality and Poverty in the United States,” Institute for Research on Poverty (Discussion Paper no. 1166–98: July 1998), p. 21, available at http://www.irp.wisc.edu/publications/dps/pdfs/dp116698.pdf. 8Andrew Glyn et al., The Rise and Fall of the Golden Age of Capitalism: Reinterpreting the Postwar Experience (New York: Oxford University Press, 1990). 9Lyndon Johnson, Remarks at the Johnson County Courthouse, Painstville, KY, 1964. The American Presidency Project at the University of California, Santa Barbara, available at http://www.presidency.ucsb.edu/ws/?pid=26190. 10James T. Patterson, Grand Expectations: The United States, 1945–1974 (New York: Oxford University Press, 1996), p. 538. 11Alan Brinkley, The Unfinished Nation: A Concise History of the American People, 4th ed. (New York: McGraw Hill, 2004). 12Patterson, Grand Expectations (1996), pp. 539–40. 13Address to a convention of the National League of Cities by HUD Secretary Robert Weaver, March 30, 1966. Record Group 207, Federal Archives, College Park, MD. 14Scott Kohler, “Bedford-Stuyvesant and the Rise of the Community Development Corporation,” Duke University Sanford School of Public Policy, Center for Strategic Philanthropy and Society (Case Study 33: 1966), available at https://cspcs.sanford.duke.edu/sites/default/files/descriptive/bedford-stuyvesant. pdf. 15Avis Vidal, Rebuilding Communities: A National Study of Urban Community Development Corporations (New York: New School for Social Research, 1992), p. 2. 16National Congress for Community Economic Development (NCCED), “Reaching New Heights” (June 2006), p. 4, available at http://community-wealth.org/content/reaching-new-heights-trends-and-achievements-community-based-development-organizations. 17CDFI Fund, U.S. Treasury. Exact numbers available at https://www.cdifund.gov/programs-training/certification/cdfi/Pages/default.aspx. 18Luis G. Dopico, “20 Years of CDFI Banks and Credit Unions: 1996–2015: An Analysis of Trends and Growth,” Opportunity Finance Network (January 31, 2017), available at http://ofn.org/sites/default/files/OFN_CDFI_CreditUnion_LongStudy_FINAL.pdf. 20Paul Grogan, “The Future of Community Development,” Investing in What Works for America’s Communities: Essays on People, Place & Purpose, edited by Nancy O. Andrews and David J. Erickson (San Francisco: Federal Reserve Bank of San Francisco and Low Income Investment Fund, 2012), p. 188. 21J. Christopher Mihm, “Managing Successful Organizational Change in the Public Sector,” Debating Public Administration: Management Challenges, Choices, and Opportunities, edited by Robert F. Durant and Jennifer R.S. Durant (Boca Raton, FL: CRC Press, 2013), p. 24. 22Fay Hanleybrown, John Kania, and Mark Kramer, “Channeling Change: Making Collective Impact Work,” Stanford Social Innovation Review (January 26, 2012), available at http://ssir.org/articles/entry/channeling_change_making_collective_impact_work. The original article on this topic was written by John Kania and Mark Kramer, “Collective Impact,” Stanford Social Innovation Review (Winter 2011), available at https://ssir.org/articles/entry/collective_impact. 23Tom Wolff et al., “Collaborating for Equity and Justice: Moving Beyond Collective Impact,” Nonprofit Quarterly (January 9, 2017), available at https://nonprofitquarterly.org/2017/01/09/collaborating-equity-justice-moving-beyond-collective-impact. 24David Erickson, Ian Galloway, and Naomi Cytron, “Routinizing the Extraordinary,” Investing in What Works for America’s Communities: Essays on People, Place & Purpose, edited by Nancy O. Andrews and David J. Erickson (San Francisco: Federal Reserve Bank of San Francisco and Low Income Investment Fund, 2012), pp. 377–406. I should note that my co-editor who co-created the idea for the community quarterback, Nancy O. Andrews, and I disagree on this point. We agree to disagree. 25For more on Beyond Housing, see http://www.beyondhousing.org/our-leadership. 26John Bridgeland and Peter Orszag, “Can Government Play Moneyball?” The Atlantic (July 2013), available at https://www.theatlantic.com/magazine/archive/2013/07/can-government-play-moneyball/309389/. 27For a good overview of complex adaptive systems, see Melanie Mitchell, Complexity: A Guided Tour (New York: Oxford University Press, 2009). 28This phrase was first coined by Kevin Jones, co-founder of the Social Capital Markets (SOCAP) conference. 29We are all in debt to Clyde Hertzman for this powerful idea. For more, see his paper titled “The Biological Embedding of Early Experience and Its Effects on Health in Adulthood,” Annals of the New York Academy of Sciences 896 (1) (December 1999): 85–95. 30Robert Wood Johnson Foundation Commission to Build a Healthier America, Beyond Health Care: New Directions to a Healthier America (Princeton, NJ: Robert Wood Johnson Foundation Commission to Build a Healthier America, 2009). 31World Health Organization, “Constitution of the World Health Organization: Principles” (July 22, 1946), available at http://www.who.int/about/mission/en/. 32John Williams, “The Health of Nations,” Presentation to the National Interagency Community Reinvestment Conference, Los Angeles (February 10, 2016), available at http://www.frbsf.org/our-district/press/presidents-speeches/williams-speeches/2016/february/health-of-nations-interagency-community-reinvestment-conference/. 33Centers for Disease Control and Prevention, available at https://www.cdc.gov/chronicdisease/. 34Jessie Gerteis et al., “Multiple Chronic Conditions Chartbook: 2010 Medical Expenditure Panel Survey Data,” Agency for Healthcare Research and Quality (Publication 14–0038: 2014). 35Sean P. Keehan et al., “National Health Expenditure Projections, 2016–25: Price Increases, Aging Push Sector to 20 Percent of Economy,” Health Affairs 36 (3) (2017): 553–63. 36Elaine Arkin et al., “Time to Act: Investing in the Health of Our Children and Communities,” Robert Wood Johnson Foundation Commission to Build a Healthier America (2014), p. 34. 37The Center of Social Disparities of Health at the University of California, San Francisco, “Health Varies by Income and Across Racial or Ethnic Groups,” Robert Wood Johnson Foundation (2008), available at http://www.commissiononhealth.org/PDF/hlth_inceg.pdf. 38The typology of this market into “buyers of health,” “sellers,” and “connectors” was developed by Ian Galloway, Federal Reserve Bank of San Francisco, for the SOCAP Health conference in 2013. For more details on that conference, see the agenda and other content at http://www.frbsf.org/community-development/events/2013/september/socap-social-capital-markets-health. 39 George C. Halvorson, Three Key Years: Talk — Read — Play — Sing to Support & Help Every Child in America, (Sausalito, CA: Institute for InterGroup Understanding, 2014). See chapter six on reading, educational success and other factors, available at https://www.intergroupinstitute.org/userfiles/books/chapters/15/Chapter-6-Three-Key-Years.pdf. 40Emmy E. Werner and Ruth S. Smith, Journeys from Childhood to Midlife: Risk, Resilience, and Recovery (New York: Cornell University Press, 2001). 41For an extensive discussion of how “control of destiny” can improve health, see the following interview with S. Leonard Syme available at https://www.youtube.com/watch?v=cU8xTOumoQc. 42 The Commonwealth Fund, “In Focus: Reimagining Rural Health Care” (March 30, 2017), available at http://www.commonwealthfund.org/publications/newsletters/transforming-care/2017/march/in-focus. 43Elizabeth Kneebone and Emily Garr, “Suburbanization of Poverty: Trends in Metropolitan America, 2000 to 2008,” Brookings Institution (2010), available at http://media.timesfreepress.com/docs/2010/02/Brookings_report_on_poverty_0208.pdf. 44Erickson et al., Investing in What Works (2012). p. 392. 45Erickson, Housing Policy Revolution (2009). 46This was a comment onstage by Shonkoff at the Federal Reserve System Community Development Research Conference (Washington, DC, March 23–24, 2017). More information is available at https:// minneapolisfed.org/community/tenth-biennial-federal-reserve-system-community-development-research-conference/agenda. 47Mark Granovetter and Patrick McGuire, “The Making of an Industry: Electricity in the United States,” The Laws of the Markets, edited by Michel Callon (Malden, MA: Blackwell, 1998), pp. 147-73.